It’s no big secret that we are in the middle of a retirement crisis. An entire generation of Americans are about to retire with little or no assets to support them. Many of them will not even have the option of continuing to work for either health or job related reasons. Only fourteen percent of Americans surveyed by Employee Benefits Research Institute (EBRI) are very confident that they will have enough money to live comfortably throughout their retirement years, while half are not too confident or not at all confident that they will have enough. Not surprisingly, large debt overhangs concern many of the respondents. Another survey by Merrill Lynch found a large number of people have shifted their projected retirement date to as late as 85 or “whenever they have enough.” Having failed to plan for retirement at age 65 they will presumably fail to plan for 85 as well, the rest may very well never have enough. Of course, the overarching problem is that across the entire American public, no one is saving anything. 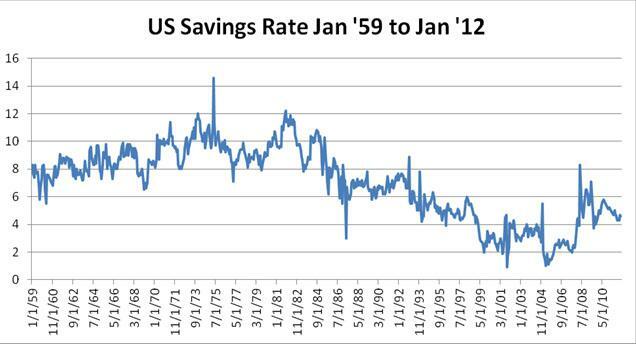 Savings rates are grossly inadequate to provide for retirement, even if that was the single objective a family had. The EBRI study found that over half of workers with any savings at all report that they have less than $25,000 put away. Given that amount, most advisors would be very uncomfortable withdrawing more than $1,250 per year to support your lavish lifestyle. Plainly put, most Americans have forgotten how to save, or even consider that it might be a good idea. It wasn’t always like that. We used to save. But for more than 30 years we have been on a binge. Beginning about 1982 savings rates fell from about 12% of disposable personal income to close to zero as reported by the U.S. Department of Commerce. Importantly, note that these figures include both debt reduction and contributions to pension plans and 401(k)s. While savings rates typically spike during recessions, there is every indication that we have reverted to our old wasteful ways after being temporarily scared straight in 2008 and 2009. Our bad behavior spending spree was gleefully enabled by a wallet full of credit cards and bankers ever so happy to endlessly re-finance your house for amounts exceeding its market value. As the Baby Boomer demographic hump inexorably inched its way toward retirement their savings rate steadily fell. So, it should come as no surprise that age 65 has become a fantasy retirement date for an entire generation. They have chosen to think about it later until it’s too late to do anything about it. Strangely, while many Americans report that retirement is an important economic concern, very few have even bothered to compute how much capital they might need to finance their life style at retirement, or how much they would have to save to get there. Yet, with an Internet hosting uncounted free retirement planning calculators, few avail themselves of the service. Interestingly, of those that have made a calculation the average savings rate and accumulation are more than double those that haven’t. Retirement planning is not rocket science. There are only three factors that determine if you will ever be able to retire: How much you save, how long you save, and what rate of return you get on your savings. Notice that two of the three elements are directly under your control. Savings doesn’t happen by accident. You can attempt to budget savings, but that rarely works. There is always another iPad to buy, and nothing is likely to be there at the end of the month. The most effective plan is to save first. Put your savings on autopilot by saving in your 401(k), IRA, or brokerage account before it hits your pocket. If you segregate your retirement funds before you are tempted to spend them, there might actually be something there when you need it. You can actually have a secure retirement, but you are responsible to make it happen. You will sink or swim on your own.